NATO will start reconnaissance flights over Poland and Romania to monitor the situation in neighboring Ukraine where Russian forces have taken control of Crimea, the alliance said on Monday. (…) Acting on a recommendation from the alliance’s top military commander, U.S. Air Force General Philip Breedlove, NATO ambassadors gave the go-ahead to the AWACS flights, a NATO spokesman said. 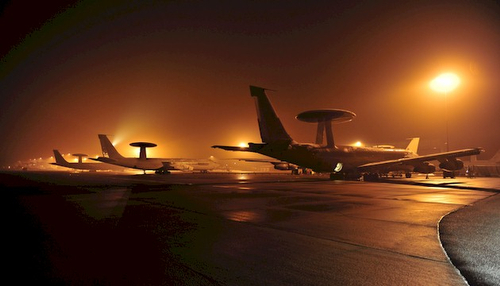 AWACS (airborne early warning and control) planes will fly from their home airbases in Geilenkirchen, Germany, and Waddington in Britain, the spokesman said.